'If I could buy stock in Uber right now, I would,' says Lead Edge Capital managing partner Mitchell Green. Uber Technologies Inc. may be a tech unicorn, but it's certainly not winning the Silicon Valley darling of the year award. The company seems to be generating a never-ending slew of negative headlines in 2017. The latest story surrounds ousted CEO Travis Kalanick fighting back against Benchmark Capital, which owns 13% of Uber and controls 20% of the voting power, trying to push him off the Uber board as well. Kalanick in court documents filed Thursday, Aug. 17, called the lawsuit a "public and personal attack." But Mitchell Green, managing partner of Uber investor Lead Edge Capital, said he's not worried about the streak of scandals at the private ride sharing company. He noted that he's been invested in Alibaba Group Holding Ltd. (BABA - Get Report) since it was trading around $6 (shares were near $169 at midday Friday) and has seen opinions on the Chinese e-commerce giant go from negative to positive; shares are up more than 92% year to date. "I've seen every negative headline you can write about a company," he said. "Reality versus the press is different." Uber has suffered attack after attack this year, beginning with calls for Kalanick to quit President Donald Trump's now-dissolved council of business leaders in early February. (He did.) Since then the most notable scandals include former Uber engineer Susan Fowler writing a blog post with sexual harassment claims, Alphabet Inc.'s (GOOGL - Get Report) Waymo unit suing the company for allegedly stealing self-driving car secrets, a video tape of Kalanick yelling at a driver going viral, the New York Times story on the company using tech to trick authorities that were trying to keep it out of certain cities and Uber president Jeff Jones resigning. Following a letter from investors demanding that he step down from the chief executive post, Kalanick resigned in June. But while Uber, valued at about $62 billion, needs changes, including better senior management, it's still "killing it" as a whole, Green said. "If I could buy stock in Uber right now, I would," he added. Uber seems to be doing fine on the financial side. The company's first-quarter revenue tripled year over year to $3.4 billion. The company, however, is losing market share as customers become wary of the company in the wake of the wave of criticism. While Uber is still estimated to hold a majority market share in the ride sharing sector in the U.S., it's taken a hit this year. 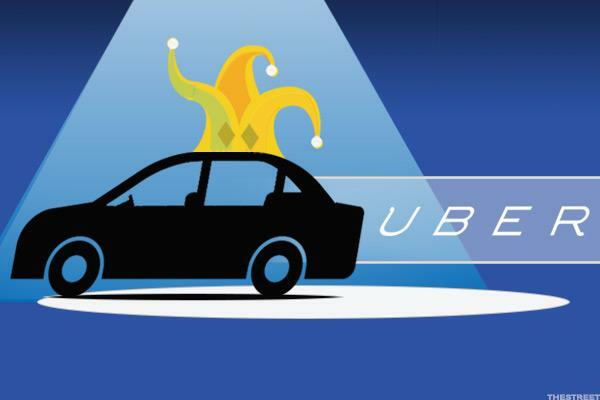 Data from Second Measure Inc. shows that Uber's market share dropped to 77% at the end of May from 84% in January. Meanwhile, rival Lyft Inc.'s market share jumped to 21.7% in June from 12.4% in January 2016. Green nevertheless is confident that this will prove to be a blip for Uber. "When you have 85% market share, it can only go one way," he said. Still, Green admitted that with Lyft closing a $600 million round of new funding in April, there's still room for it in the ride sharing space. "Both can thrive, but Uber will have majority market share," he said. Lyft, valued at $7.5 billion, seems to have the same confidence in its own future. "Lyft is currently gaining market share faster than they ever have," Ben Horowitz, a partner at Andreessen Horowitz who sits on Lyft's board, told the San Francisco Chronicle in July. Alphabet is a holding in Jim Cramer's Action Alerts PLUS Charitable Trust Portfolio. Want to be alerted before Cramer and the AAP team buy or sell GOOGL? Learn more now.